Each of these components should be understood in order to properly use the inventory feature in Control. Inventory Level Available Available Inventory is the amount of inventory available for new orders, which is the amount on-hand less any amount reserved for orders in WIP. Inventory Level Reserved by Orders The inventory Reserved by Orders is tracked automatically in Control, and records the amount of inventory that is currently reserved by orders in WIP. This quantity is automatically adjusted (based on store options) as an order is worked on. Inventory Level On Hand On-Hand Inventory refers to the total amount of material currently in inventory. Inventory Level On Order On-Order Inventory is the amount of the item on order. This number can be manually adjusted, or automatically increased through the use of purchase orders. Inventory Level Expected Expected Inventory refers to the amount expected is the amount available plus the amount on order. Inventory Level Billed Inventory Billed is on-hand inventory that has been fully accounted for in the accounting system (GL). Inventory Level Received Only (not billed) Inventory Received Only is a special category of inventory that has been received into inventory (normally via a receiving document), but the bill for this inventory has not yet been posted. All inventory items must be parts. Parts are the basic object used for tracking inventory in Control. To enable inventory tracking for a specific part, check the “Track Inventory” checkbox at the top of the part. You will notice that a new Inventory tab appears for the part. On the inventory tab, the various inventory levels (described previously) are shown, along with various other stocking information (like reorder levels and reorder points). Inventory Account + Qty Billed Unit Cost * Qty Billed The inventory account is also specified on the Inventory tab in Parts setup. Inventory Adjustment Unit Cost * Qty Billed This is a System Account and cannot be changed. Disabling Inventory will result in the inventory being adjusted to zero, and the corresponding GL entries made. Further, all Received Only and On-Order Inventory will be set to zero. Adjusting inventory levels can be done in several ways. One method, mentioned in the last section is to open the part and adjust the inventory manually. This method works for the adjustment of one or a few parts, but is not very efficient when setting initial inventory levels en masse or adjusting inventory levels after a periodic inventory. During these times, you will want to take advantage of the “Adjust Part Inventory” utility (from the main menu, under Vendors). The quantity changes for Adjusted Received Only and Adjusted On-Order entries will be tracked, but no GL entries are adjusted. Adjusting part costs can be done in several ways. One method is to edit the part and manually adjust the unit cost. This method works for a few pricing changes, but quickly becomes tiring when adjusting your costs en masse (such as when putting in your costs initially). During these times, you will want to take advantage of the “Adjust Part Cost” utility (from the main menu, under Vendors). In addition, each line item in a PO may have its own status. The line item statuses will automatically change when the PO status is changed if there has not been other activity on them. For example, if you have posted a receiving document against a PO, the lines of the PO may be set to Partially Received and will not change when you change the PO status. When a PO is changed to Ordered, the On-Order Inventory level for inventory parts are automatically adjusted based on the PO. Based on your selection for each line item, the appropriate action will be taken. 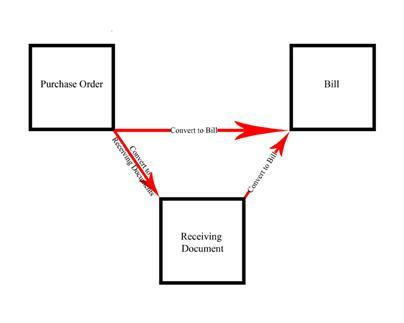 Since there is not a bill (and corresponding value), no GL entries are created by Receiving Documents. However, the On-Hand and Expected quantities will change based on the RD created above. When you enter a bill that contains an inventoried part, Control will adjust the inventory levels and (optionally) the average cost. The options available are dependent upon the setup of the part, as is explained below. Based on the choice, the new inventory is first transferred from a status of either Received Only or On-Order, then from the other status (if balances remain). In all cases, the Billed Quantity will be increased by the quantity of the bill. Adjust the average cost for increases only. The default for these options can be specified in Accounting Setup. Option #1: Adjusting the average cost. Option #2: Using current average cost. The new average cost doesn't change, so we must adjust for the price of the part in the current bill when recording it. Option #3: Adjusting the average cost for increases only. Under this method, the calculation of new average cost is determined. If this results in an increase in the average cost, Option #1 applies. If this results in a decrease in the average cost, the current cost is maintained and Option #2 applies. For custom parts, expenses, and other line item types__, no cost adjustment options apply.